As previously, noted, we think the Renault Twizy’s greatest strength is in the fact that it’s not a car – it offers something completely different and fun for travellers who just want to get short distances cheaply and using very little energy. Perfect, for example, for the hilly rural area where we live and work where many people’s journeys are less than 5 miles but up and down very steep hills to the nearest village or town. We also think that the Twizy’s “not-carness” gives it a chance of disrupting the car market in a way that more conventional electric cars are struggling to do (because they automatically get compared unfavourably with the existing market products). The most obvious symbol of the Twizy’s not-carness (or so we thought) was that it didn’t bother at all with doors thus making a statement about the kind of short journeys it expected to make. It appeals, for example, to people who might cycle but don’t want the physical effort (especially on our hills) or people who might use a motor scooter but are nervous of driving a two-wheeler and don’t want to get soaked in the rain. The fact that the basic Twizy is completely open-sided makes a statement – this is not trying to be your average car. Think differently! You won’t expect to go far in this, you will need warm clothes and a hat in winter and it’s obviously not intended to be your main car or carry you long distances. Of course, on sunny summer days, it’s delightful to drive along open to the elements especially on our country lanes and open hillsides. But come winter, don your warm coat and hat (which you will need anyway when you get out of any car) and whizz along the few miles to work or the shops. The good news is that you don’t get wet even in our open-sided version – well not until you stop! 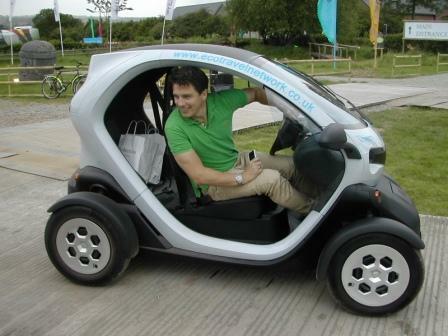 But, we discover that most people are choosing the Twizy with doors option. And then unfortunately, psychology cuts in. If you have doors, it feels odd (when it rains) not to have windows which you can close. I have driven both kinds of Twizy in the pouring rain and it certainly feels odder in the doored version not to have windows – I almost found myself reaching out to close them. In our own, open-sided version, it might be pouring with rain just beyond elbow reach but the concept of windows doesn’t cross your mind – how could it when you don’t have any doors?!. So, maybe inevitably, just months after the Twizy is released, there’s already an add-on accessory of windows and now as autumn approaches, the Twizy owners with doors and windows have started discussing heaters!! Again, the advantage, if you will, of our open-sided version, is you can’t really discuss heaters! A few Twizy owners are thus turning their vehicles step by step into ‘proper’ cars and the risk is death, effectively, by focus-group-think of a winningly different concept for local, low-energy travel. I hope I’m not right and I also hope those Twizy owners who seemingly really want a car realise that and buy themselves a small, conventional electric car instead. Once people think of Twizys as proper cars, they lose their challenge to our car-centric mindset. They will start to be compared with small “proper” cars and may risk being written off as somewhat inferior – unless of course padded seats are introduced, proper doors and windows and a greater speed and range. Then, hey presto, you have small quite pricey electric car just like the other small electric cars on the market. We have one such as a community electric car – it’s functional but it offers nothing new or different and is certainly unlikely to challenge the existing market. The Twizy, as envisaged by Renault, is a challengingly different travelling concept for short journeys. It says something different and offers different values and thereby disrupts our assumptions about car travel and energy. I hope that Renault has the courage to stick with their original idea. This entry was posted in Psychology and tagged disruptive, doors, electric vehicles, psychology, Renault Twizy, windows. Bookmark the permalink.